Murfreesboro Police are investigating gunfire that left two women with gunshot wounds. 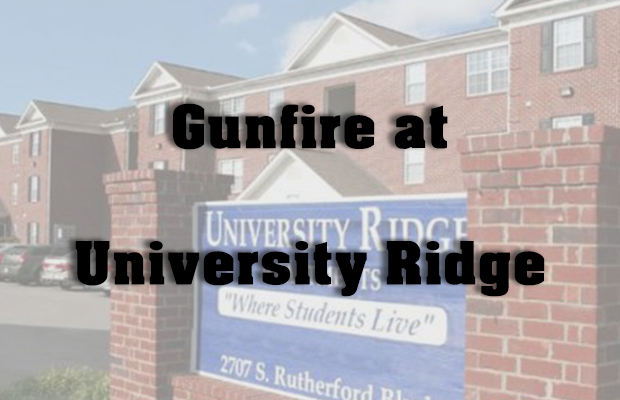 It happened Saturday morning, just before 1am when authorities were called to University Ridge Apartments on Lascassas Pike. A witness reports a party was going on in the 11-hundred building when gunfire erupted and at least five shell casings were found in her apartment. Murfreesboro Police Officer Jarrod Davis reports two victims were struck by stray bullets while crossing the parking lot. Twenty-year old Chelsea Duke and 22-year old Kamburn Gilbert were taken to the St. Thomas Rutherford emergency room for treatment. MPD detectives were called to the scene, where multiple shell casings were found and at least three vehicles were also hit by bullets. Those responsible will face charges of shooting into an occupied dwelling, aggravated assault, reckless endangerment and vandalism.